And sometimes, they are interesting. In the spot of Kuala Lumpur, one of the once thriving Malaysian restaurants of Houston, a new restaurant has established itself - Managua. 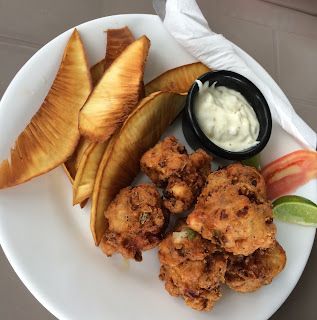 I don't think I have had Nicaraguan food before, and this may be worth exploring. When a group first attains critical mass in America, its restaurants are mostly for its own members. Later, as these groups gain confidence, they begin selling their more accessible foods to a general public craving cheap exotic eats. These dishes then mutate into American form, a la chow mein, and the group's American-born children typically spurn these foods as they try to assimilate. Around the third or fourth generation, the descendants of immigrants are secure enough in their American credentials to explore their "roots." Shortly thereafter, food nostalgia sets in, and the quest for the "authentic" begins.